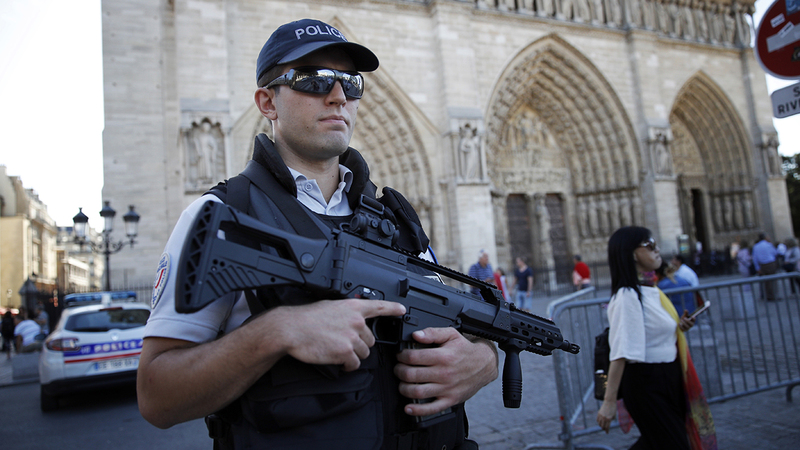 PARIS, France -- A failed attack involving a car loaded with gas canisters near Notre Dame Cathedral was spearheaded a group of women that included a 19-year-old whose written pledge of allegiance to the Islamic State group was found by police, a security official said Friday. The teen, Ines Madani, stabbed a police officer with a knife and was shot in the leg Thursday night in a raid south of Paris, police said. France's interior minister described the pursuit as "a race against time" to find Madani and the two women with her before they struck. Another of the women had, at one point, been in close contact with the extremist who killed two French police officials earlier this year before he was shot to death, two officials said. A man arrested Thursday also had ties to the dead jihadi, Larossi Abballa, who filmed himself on Facebook Live pledging allegiance to Islamic State as he sat in the home of the dead officials, one of the officials said. Security in train stations around Paris was visibly higher Friday as the investigation widened. "There's a group that has been annihilated, but there are others," French President Francois Hollande said Friday. "Information we were able to get from our intelligence services allowed us to act before it was too late." One of the security officials, who was not authorized to be publicly identified, said French authorities found a note on Madani declaring allegiance to the extremist group, which has called on followers to attack France. The official said Madani was hospitalized. Another official, who also cannot be identified when speaking about the investigation, said Madani had pulled a knife during the raid outside a small apartment building near the Boussy-Saint-Antoine train station. In video filmed by a neighbor, a veiled woman, her face uncovered, is seen being carried away by police as she cries out "Allahu Akbar" or "God is the Greatest" in Arabic. Five women and two men have been arrested in the case. The car loaded with gas canisters belonged to Madani's father, who flagged her to police on Sunday 14 hours after the vehicle was discovered. Since then, authorities worked frantically to untangle the relationships among the group and thwart what they increasingly feared was another plot.